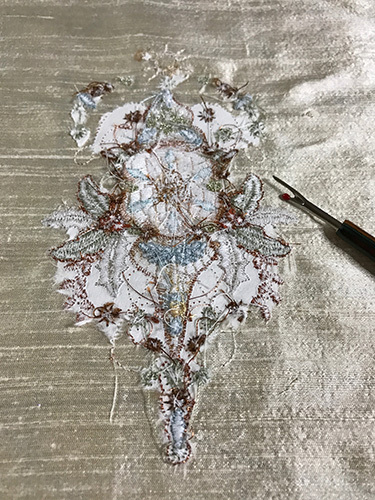 "digitising and creating breathtakingly beautiful machine embroidery!" Each year I make it my aim to embroider a very special Christmas card for my sister. This year I was inspired by some wrapping paper. It wasn’t necessarily the design but the colour scheme that caught my eye. Something less traditional in grey, sage and bronze, with an element of metallic threads. I decided that elaborate baubles with some seasonal sprigs of holly and leaves would be perfect. This design will be developed into a full collection and released in 2017. Here is my design removed from the hoop. 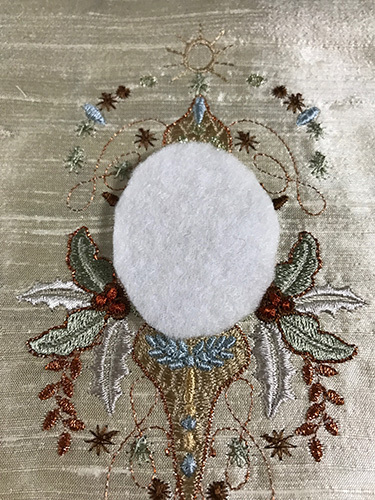 I stitched it out on a deep ecru silk dupion. 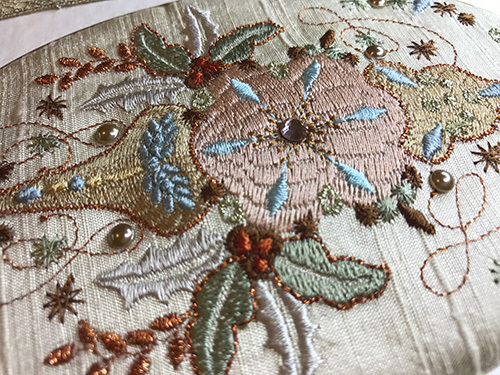 As I used metallic threads and this is quite a dense design, the back was quite a jumble and I was only able to remove the two layers of stitch and tear from around the edges. Then I pressed the embroidery from the back. 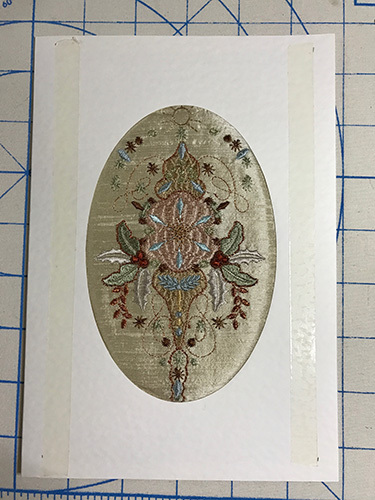 Using the opening in my card I made a template of batting and a smaller one for the area where the bauble is hoping this will make it more pronounced. Cannot say that this really made some difference but it was worth trying. The 2 layers of batting sit inside the oval cut out and I used some temporary adhesive to keep them in place. You can see I trimmed the silk well within the card area and everything was stuck in place using double sided sticky tape. How lifeless it still looks. It is always difficult to find suitable cards for this sort of project and I always seem to be limited to cream or white. I decided to do something different because some delicate lace I bought earlier this year, caught my eye. After making some tiny marks to align the double sided tape I placed them vertically each side of the oval. 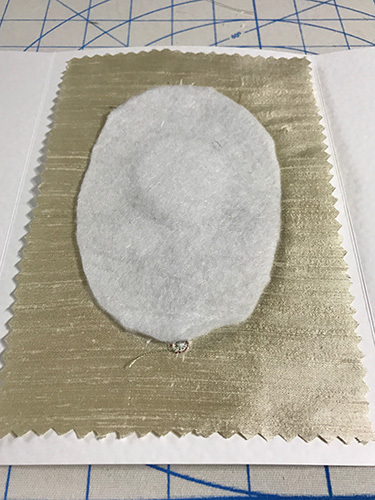 This was an after thought on my part, but it would be better to do this before you add the embroidery and seal the card, so you can pop the ends inside the folded section. 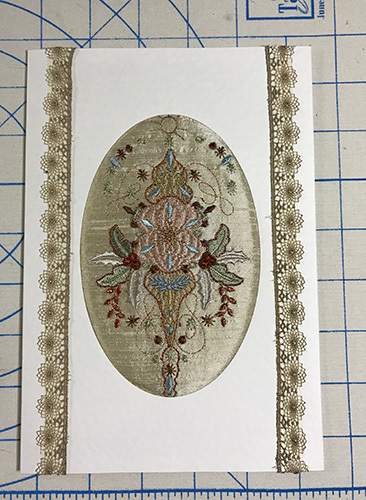 This helped no end to balance out the card and it just needs hot fix pearls and crystals to make the embroidery come alive. Despite loads of crystals I never seem to have quite the right ones. This design needs larger than normal ones I think, especially in the centre of the bauble, so I will invest in some news for when I complete the collection next year. I hope my sister likes it and that you all love it too and are intrigued as to how the collection will develop. I am looking for name suggestions for this future collection. 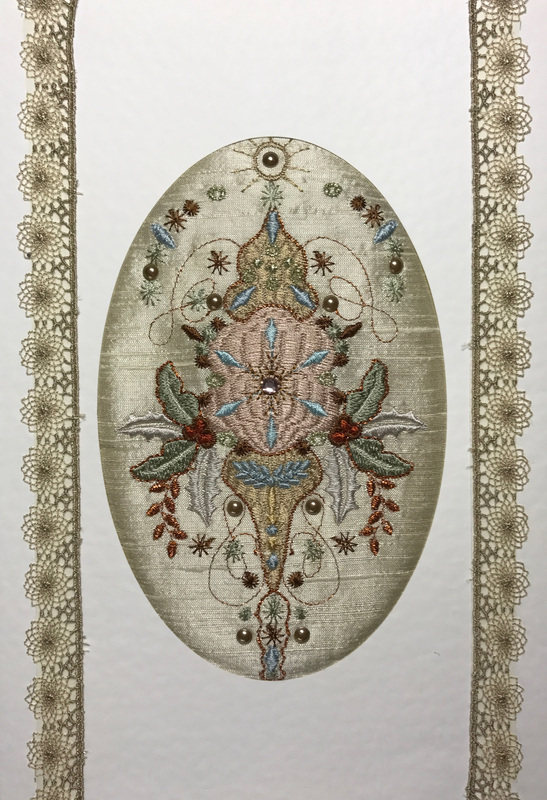 Email me yours and earn 240 Rewards at Graceful Embroidery if your suggestion is chosen, as well as winning the whole collection of designs in time for next years embroidered projects. Watch out for my blog about my new Christmas angel! 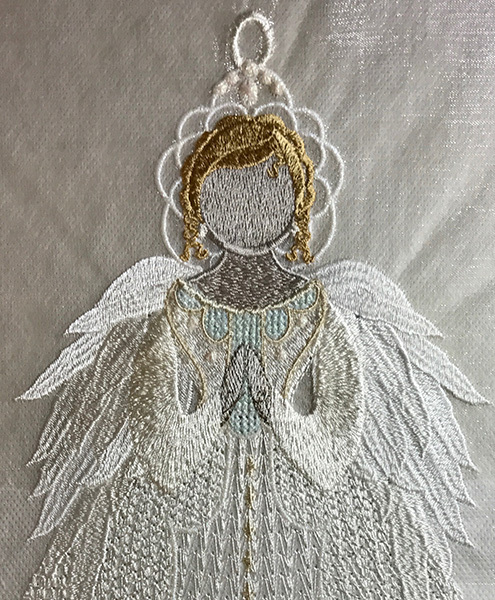 I digitise machine embroidery designs specializing in Bridal, heirloom and Celtic work. 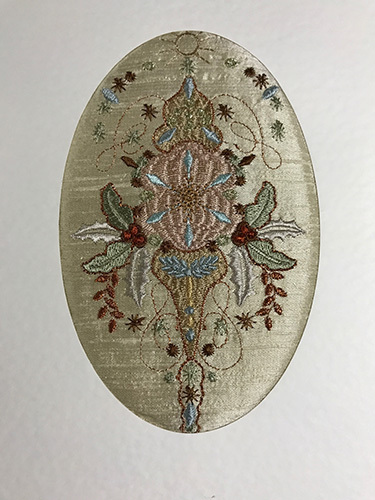 This entry was posted in Discussing machine embroidery, Embroidery projects, New Designs and tagged batting and wadding, Christmas, embroidery on silk, Making embroidered cards. Bookmark the permalink. What a beautiful card and ornament for your sister! With regards to the plain cards, perhaps using a cutting machine (Silhouette, Scan N Cut, or the like) and card stock would give you better options – there are embossing and drawing options on some of them too. Of course, the lace is a beautiful touch on this one! 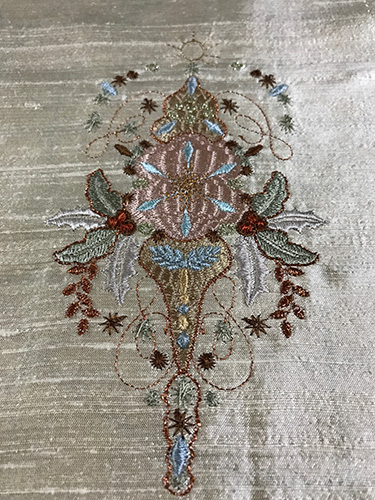 I’m no expert, but this design looks like some Jacobean embroideries I’ve seen, so the names ‘Jacobean Wonder’ or ‘Jacobean Delight’ come to mind. Merry Christmas to you and your family and friends! Happy Christmas and a wonderful New Year to you and your family!! I have decided to release this design as an individual one just until the end of the year. Details to follow. Then you can all make similar embroidered cards. This design has an old fashioned Christmas feel. What about “Christmas Baubles” or “Christmas Memories”. Really beautiful. I would call it Victorian Noel. Hazel I love your new card design. I would call it “A Victorian Season” or just “Victorian Season”.